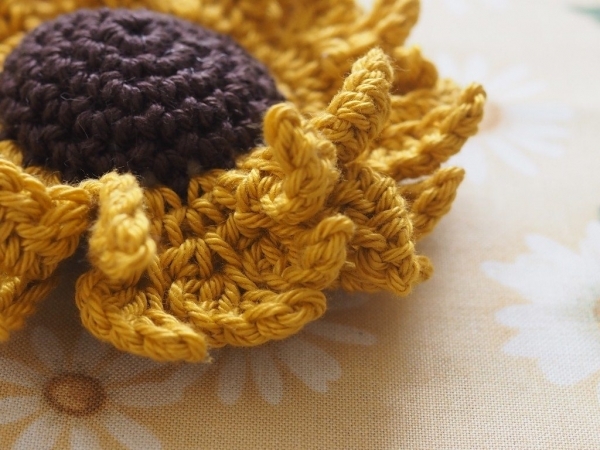 Crochet flowers aren’t just for springtime. They’re for all year long. Add them to your gift packaging, make them into bigger projects and just have fun with them. They always bring a smile to the face. So, with that in mind, here are more than thirty new flower and floral crochet patterns for you to enjoy! 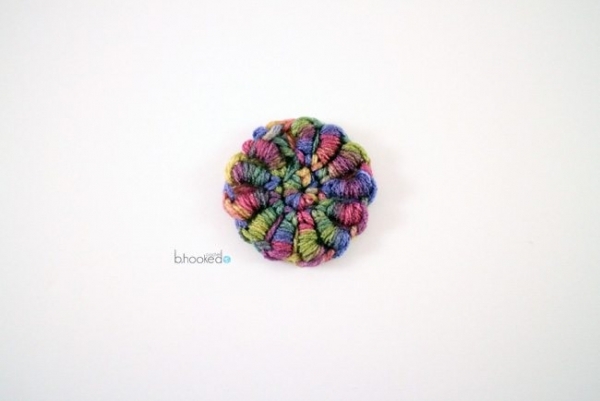 Crochet bullion stitch flower free pattern from @bhookedcrochet. What a great use of this amazing under-utilized stitch. Crochet flowers scrap scarf free pattern from Atty’s. 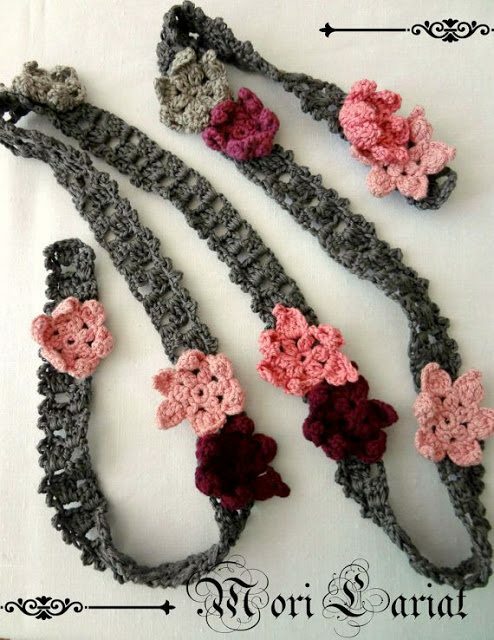 Use this free crochet pattern to make the scarf or as a starting point for any crochet flower project you’ve got in mind! 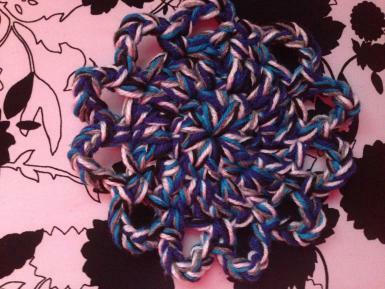 Easy chunky free crochet flower pattern. 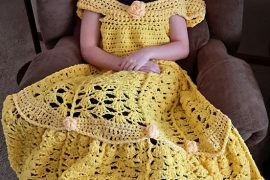 This is a really simple crochet pattern that’s just three rounds but it has a unique look because it’s a five-strand crochet project. 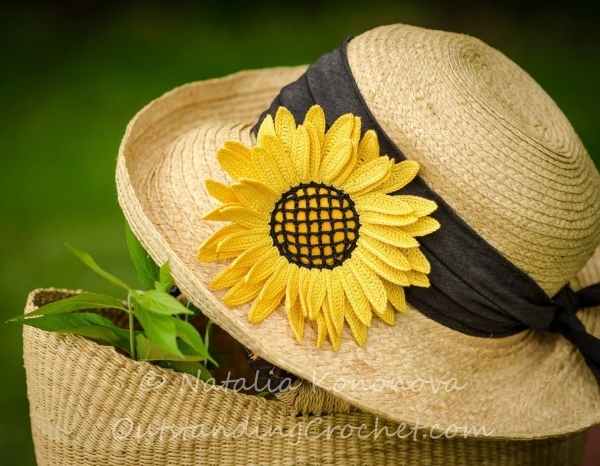 Sunflower brooch crochet pattern for sale from Outstanding Crochet; it’s amazing how many different styles of crochet sunflowers there are and each one is as beautiful as the last! Crochet flower free pattern from Little Treasures, showing instructions for how to read the pattern from a chart, so that you can learn that skill while also making this lovely little crochet flower. This one works great as a coaster! 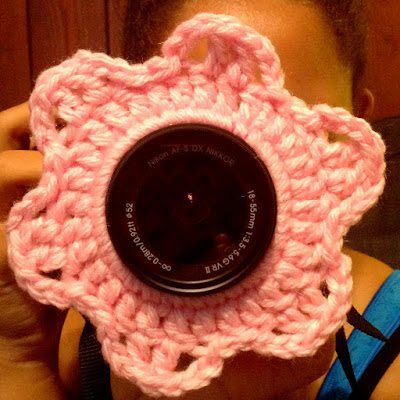 Free crochet flower pattern for camera lens from The Shtick I Do! 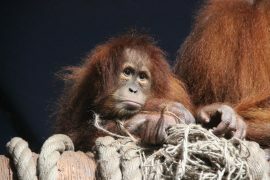 These are used when photographing children because it helps to make them smile and look right at the camera. But they also just dress up your camera in a fun way! 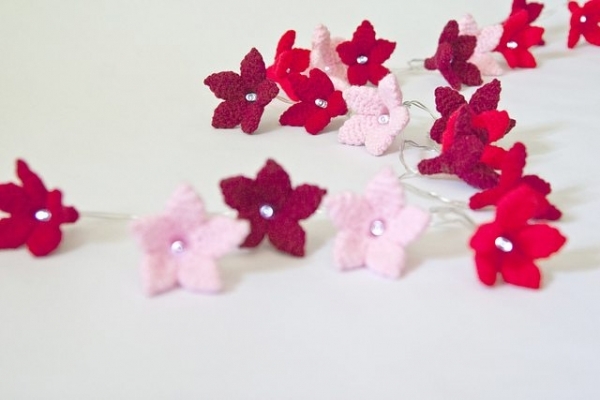 Crochet flower fairy light pattern for sale from A Bag Full of Crochet. What a great way to decorate any home! Crochet pearl flower brooch free pattern from The Woolnest. 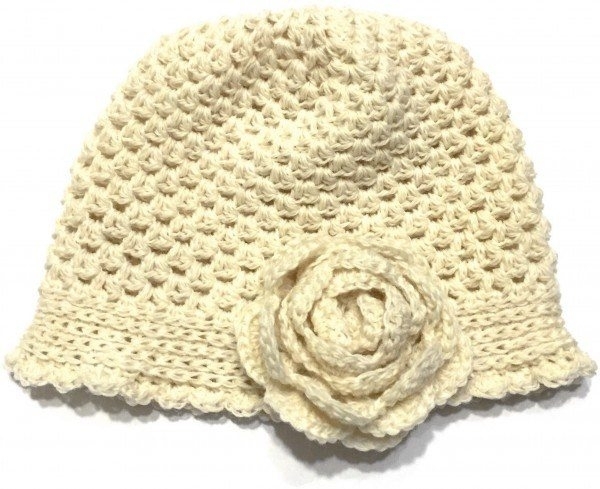 Put a pearl in the center of any crochet flower pattern and it immediately elevates it! 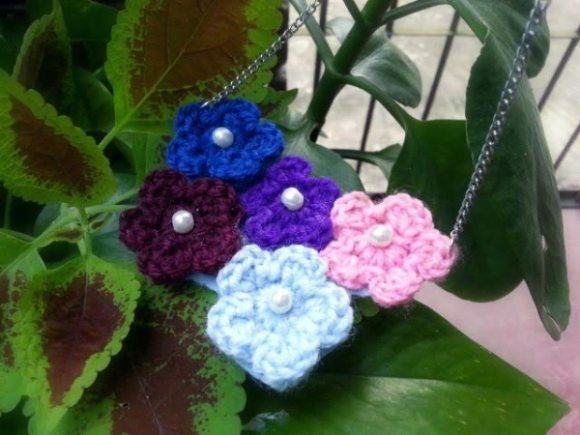 Five flowers crochet necklace tutorial from Craftbits for another example of pearl crochet. You could also replace these pearls with buttons for a different look. 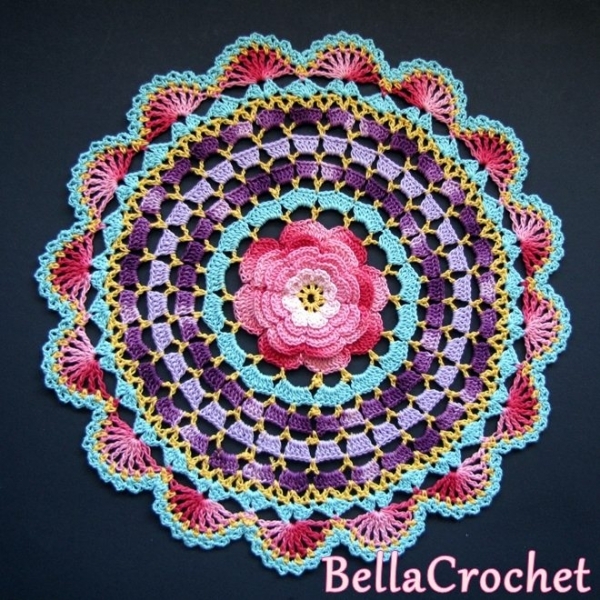 Rose mandala doily free crochet pattern from BellaCrochet; see 40+ more crochet mandala patterns here. 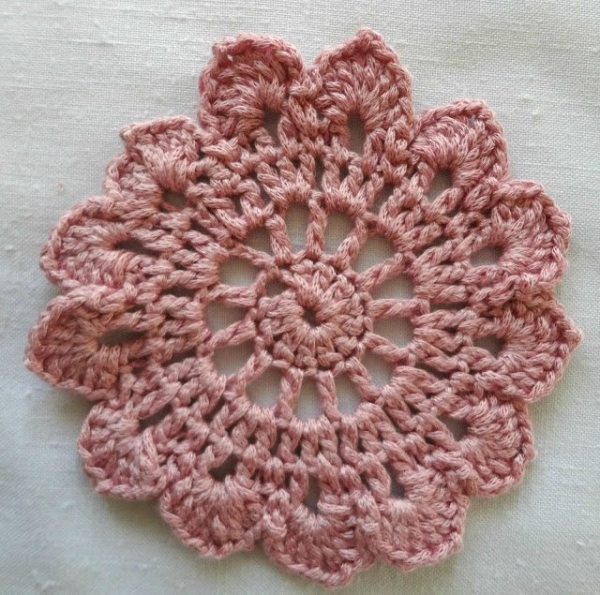 Make just the crochet flower here or go ahead and make the whole doily! 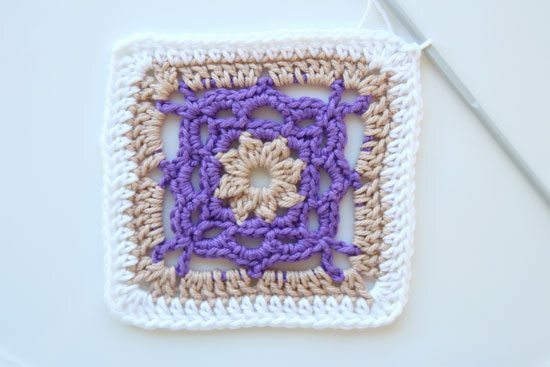 Blooming flower square free crochet pattern from Rescued Paw. Flowers inside of squares are a great choice because they can be easily joined into scarves, blankets and other big projects. You can alternate the color like you see here to create a consistent but creative design. Flower granny square free crochet pattern from Stitch Craft Create. 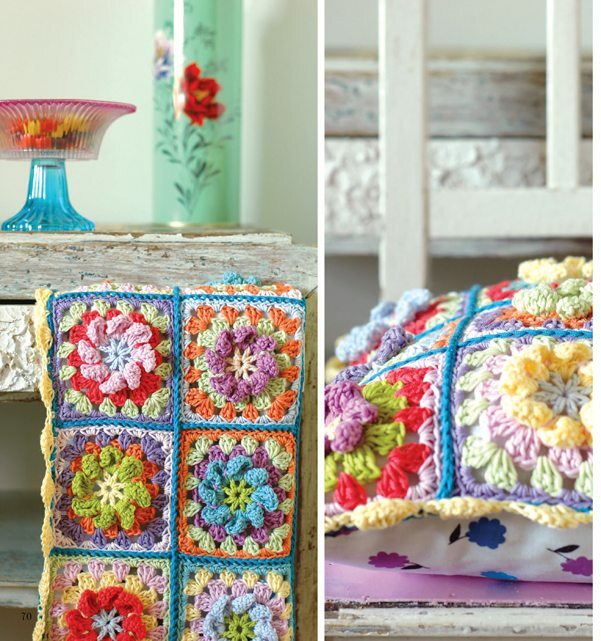 This version of a floral crochet project is brightly colored to look like a magical garden! 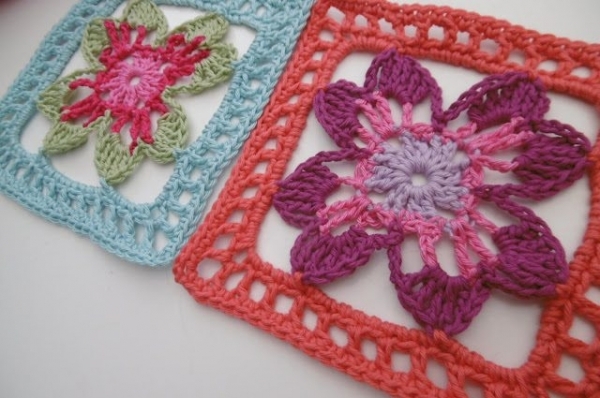 Flower square crochet pattern free from RedAgape. 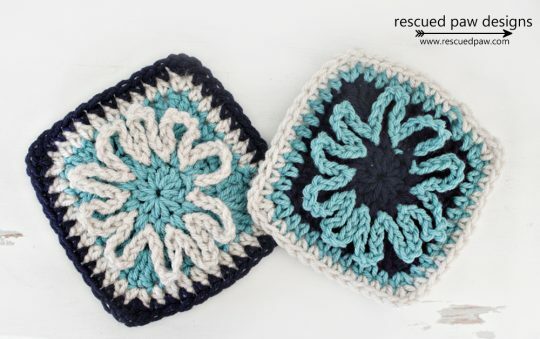 There are just a few simple rounds here and you’ve got a floral crochet square to work with. Crochet flower square free pattern from Suz Place. The flowers inside of these squares are so unique. I love the open design! This one would be great to make a crochet curtain! Granny Square Flower free crochet pattern from ByHaafner. 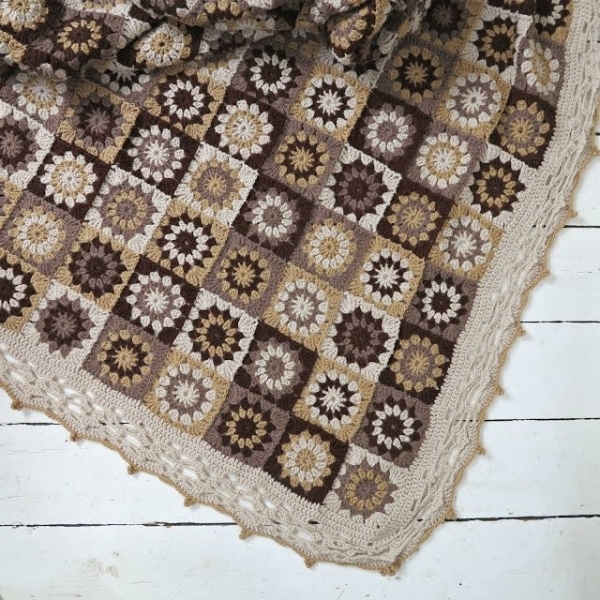 This one is worked in great retro-ish neutral colors but imagine all of the different blankets that you could make by working with a variety of palettes! 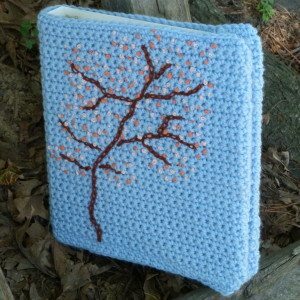 Desert in Bloom crochet blanket pattern for sale from The Lazy Hobbyhopper. It’s really unique to see a brown border for crochet blankets and it really works here with the theme of flowers in the desert! 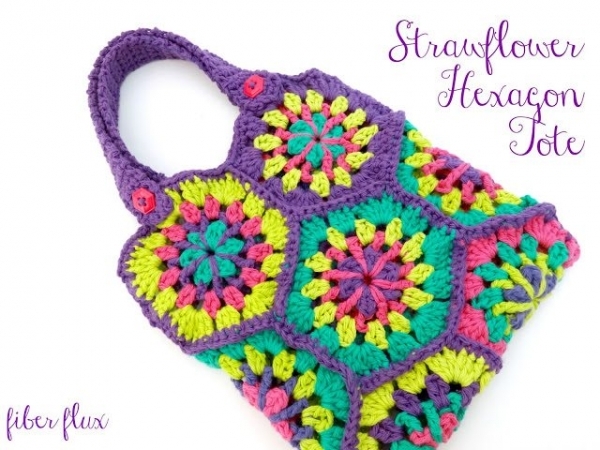 Strawflower hexagon tote free crochet pattern from Fiber Flux. Flower inside squares are common; flowers inside hexagons are unique! 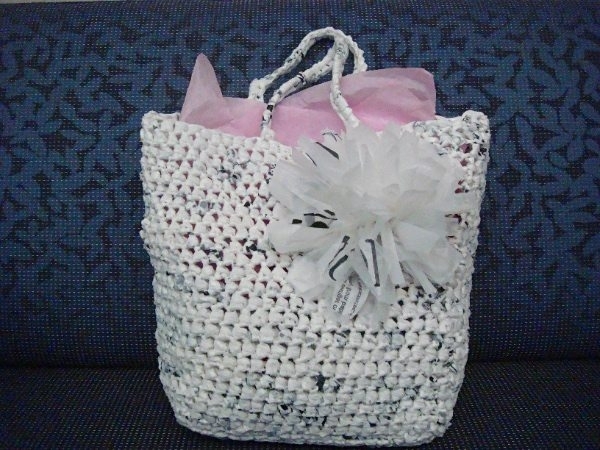 Plarn crochet gift bag with flower free pattern from Plastic Bag Crafts. Add a flower to a bag and make your plastic a treasure! 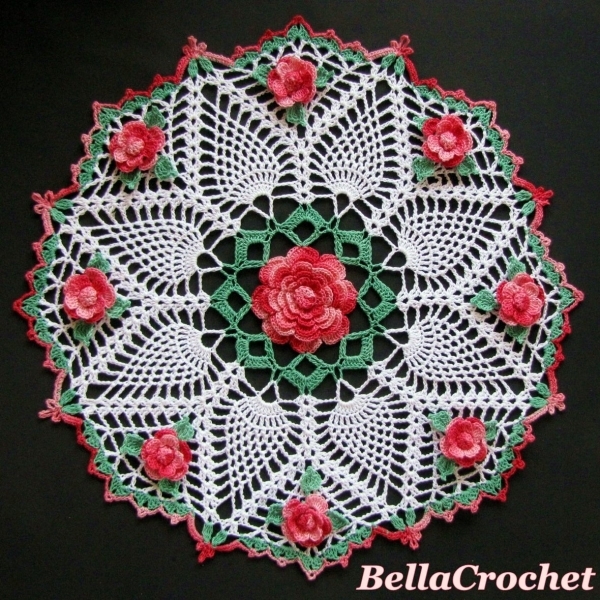 Dorothy’s Roses free crochet flower doily pattern from BellaCrochet. Beautiful. Just beautiful. Crochet flower shawl free pattern with symbol chart and photo tutorial. Instructions in English and Dutch from Atty’s blog. 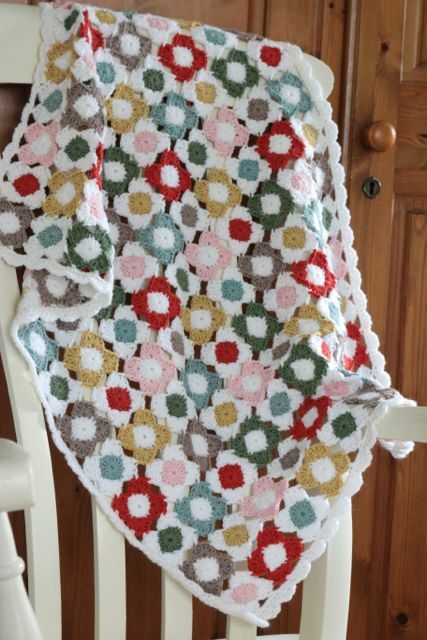 New crochet flower blanket pattern for sale from Cherry Heart – super simple flowers laid out in rows to make a terrific blanket. 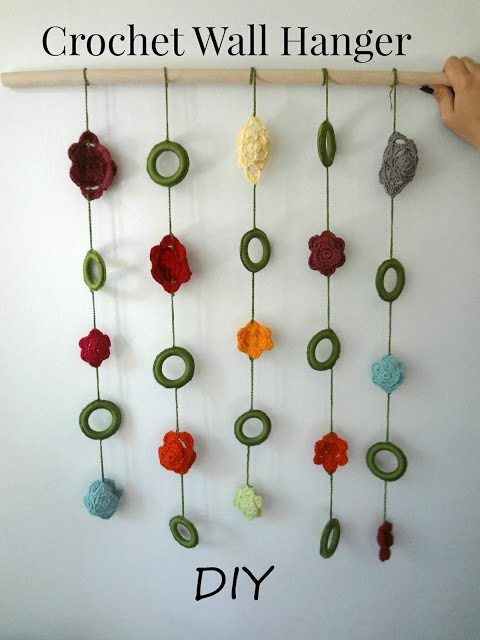 Floral crochet wall art tutorial from The Little Treasures. Make a longer version to hang in a doorway or over a window! 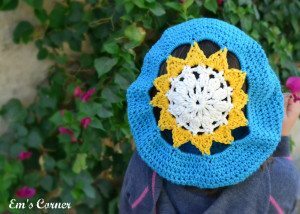 Sunflower slouch hat free crochet pattern by Em’s Corner for Happily Hooked. Flowers are often added on to hats but here it’s the basis of the design. Free crochet flower hat pattern from Not Your Average Crochet; a great example of how a flower added on to a hat makes a big impact. 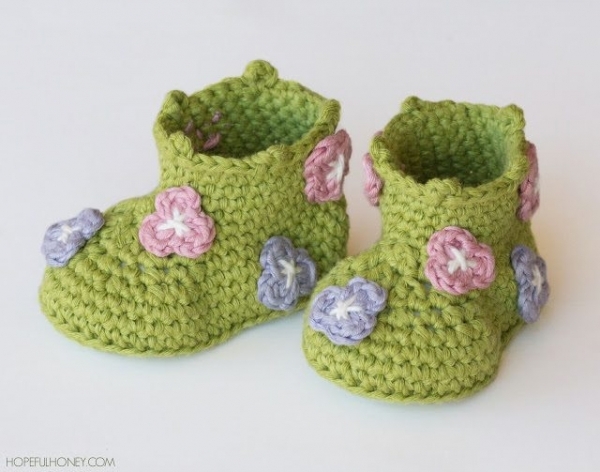 Floral crochet baby booties pattern for sale from Hopeful Honey. Such cuteness! And you could also make a bunch of those little flowers to use as appliqués or even just to fill a bowl for a gorgeous decoration! 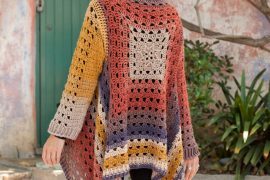 Romantic Mori Lariat crochet pattern for sale from Maya of Little Treasures – sophisticated, romantic and wonderful. 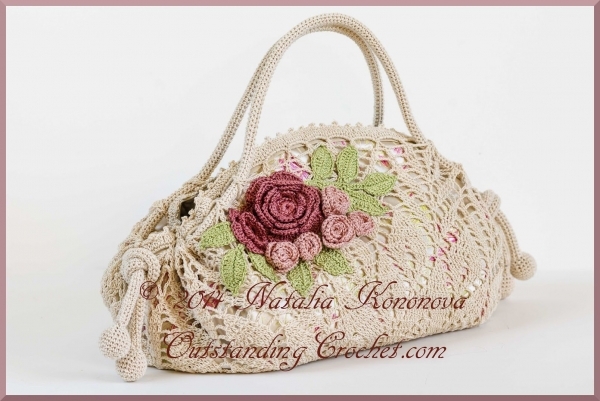 Crochet flower purse pattern for sale form Outstanding Crochet; lace adds even more romance! 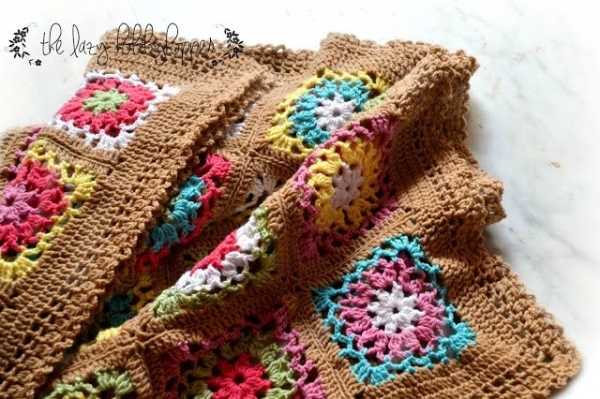 Filet crochet flower vest pattern for sale from Alessandra of Just Be Happy Crochet. The flower here is worked through filet graphics. 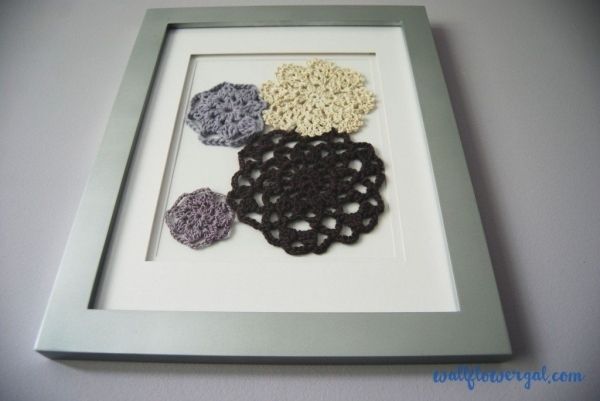 Crochet flower motif art tutorial from Wallflower Gal. Use any flower design at all to create art for your home! 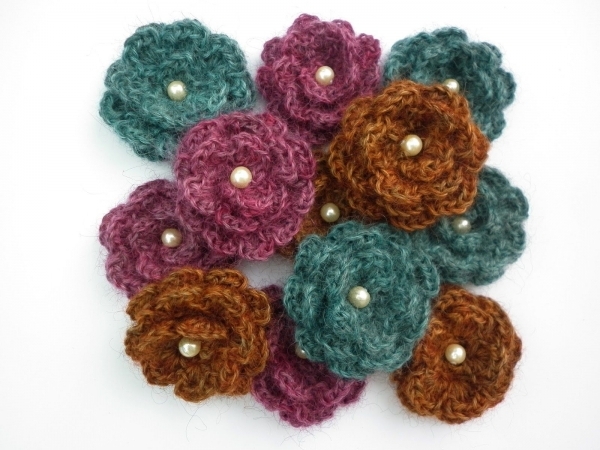 Just posted a free rosette pattern – what a coincidence with your post! Last but not least, thank you so, so much for including me!